eBay is like any other business; if you earn money doing it, you need to report those earnings to the IRS. Unlike side hustles that pay cash like pet sitting, selling items on Craigslist, selling plasma, shoveling snow, or cutting lawns, eBay sales are trackable through Paypal. When it comes time to file taxes, always consult a licensed tax professional for tax advice. 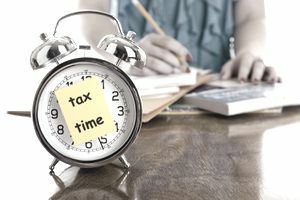 Here is what you need to know about eBay and taxes, and a few ways to stay organized so that when tax time rolls around, you won't be scrambling to find the correct documentation to file. They don't. The government has no way of seeing what you sold on eBay, or how much your sales were. They cannot look at your sales reports or access your account. If $20,000 or more was deposited into your Paypal account within 200 transactions for a calendar year, you would receive a 1099K. You will not receive a 1099K unless both conditions, $20,000 gross payments AND more than 200 transactions are met. This presents the next question. If you are intentionally purchasing items for resale this is considered a business and you should report gross sales. If you are selling items online on a regular basis, you should report the earnings. If you are in the category of running an eBay business rather than a hobby seller, it is imperative to keep good records so that you can deduct expenses. For the layperson, this means that you can subtract expenses related to your business to bring down your taxable income, resulting in paying lower income taxes. If you spend money on your business, keep receipts, and even better, record expenses in a spreadsheet monthly so that tax time isn't confusing or overwhelming. Here's the perfect spreadsheet for eBay sellers. If you do not have an accountant or CPA, it is best to search for one that comes recommended by someone you trust. Don't just rush to the closest tax professional chain or the company who has set up shop in Walmart. Taxes are serious business, and you are hiring a professional to do an important job for you. Do your homework and interview several tax professionals before turning your business over to them. Ask around on Facebook for recommendations, or ask other small business owners in your area about their CPA. Small business owners are usually eager to help each other out and when it comes to professional references. Look on Yelp for reviews or check Angie's List. Make sure you hire an experienced reputable professional. Audits are a nightmare, and you don't ever want one! *Disclosure: This is not tax advice. Always consult a licensed tax professional for tax advice.